AP and Globo sign agreement on providing media broadcast services in Brazil. 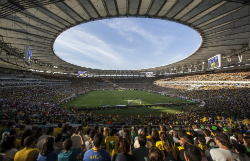 The Associated Press and Globo have announced a four-year agreement, through their AP Global Media Services (GMS) and NewSource Globo units, to provide international broadcasters with comprehensive media services and facilities at major events taking place in Brazil, including the FIFA World Cup, the 2016 Olympic Games and the Pope’s visit in 2017. The collaboration, which also covers breaking news and events such as Carnival in Rio de Janiero, will provide access to live broadcast services, including international HD transmission, live stand-up positions and studio facilities. By combining their areas of expertise, AP GMS and NewSource Globo will ensure that international broadcasters have access to everything they need, in every part of the country. Through its affiliate network Globo will provide customers with unique bureau locations across Brazil, including the Copacabana beach. In addition to providing international HD transmission from NewSource Globo facilities, AP is also opening a new studio in the Copacabana beach region, set against Sugarloaf Mountain. "With the eyes of the world on Brazil for the next four years, it is critical that we can offer international broadcasters the most comprehensive coverage opportunities," said Roberto Marinho Neto, head of sports projects at Globo. "The opportunity in the country is continuing to grow and by working with AP GMS we can ensure that Brazil is better connected with the rest of the world than ever before." Susan Henderson, head of broadcast services for North America at AP GMS, said: "Brazil is already a key region for news and events and this is only going to increase in the future. We are delighted to work with NewSource Globo and are confident that together we can provide international broadcasters everything they need to cover both breaking news and the major events in Brazil over the next four years."